Established in 1984, CRYO Industries has quickly become a leading supplier of Cryogenic systems for various research and industrial applications. We manufacture the very best in cryogenic equipment, standard or custom, open or closed cycle, continuous flow or reservoir type, miniature, hand held or room size. CRYO Industries manufactures 'performance by design' cryogenic systems that are guaranteed dependable so you won't have to compromise. We are housed in a modern facility - custom built for maximum manufacturing efficiency - which translates into high quality and cost savings that we pass on to our valued customers. 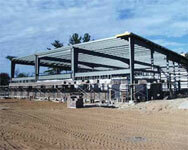 We are fully equipped to control and handle all design, machining, welding, polishing, etc. IN-HOUSE. Our products are sold worldwide and have several different sales routes. Domestic sales are done through an in-house sales force at our headquarters located near the airport in Manchester, NH. Other International sales are handled by our representative partners. We do have representatives in Europe, Far East, Middle East, Oceania, South & Central America -WORLDWIDE SALES & SERVICE! Excellent quality control and production scheduling systems to ensure efficiency in our manufacturing. The versatility to customize all of our products to fit our customers' needs. 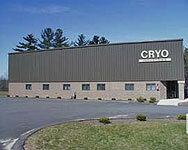 Key managers who are experienced, capable, and have many years of cryogenic industry experience. A high degree of innovation - we have the technical skills necessary to develop new products. A worldwide capable sales and service force. WE VALUE OUR CUSTOMERS. A large portion of our growth is from "word of mouth" recommendations from existing customers.